The St. Matthew Anglican Church was erected to commemorate those who served in World War One. 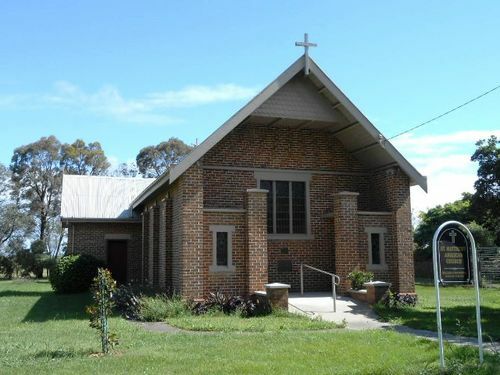 In 1923, St Matthews Anglican Church was built as a Soldiers’ Memorial church, dedicated to those who served in World War One. The foundation stone was laid by Mrs John Mills on Anzac Day, 25th April 1923. Mills was a prominent local philanthropist, who was known for her generosity to the Anglican Church and supporting returned servicemen following World War I. The church was built by the Clark Bros (and probably involved other volunteers), who also built the Tinamba Hotel opposite; the bricklayer for the church was A. E. Clark before he entered the ministry and became a reverend. Wellington Shire Stage 2 Heritage Study: Vol 2 1 Sep 2016.